Gran Maestro Series There are 11 products. 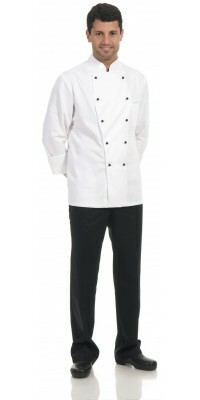 Corbara’s Chef Uniforms: quality and class without compromises with Gran Maestro line. - Gran Maestro man Jacket, available in black and white, and Dama women Jacket, available only in white, both with the stars embroidered on the collar and Corbara’s logo embroidered tone on tone on the sleeve; these jackets represents the ideal choice for those who prefer a quality jacket that can be customized with their logo and name. 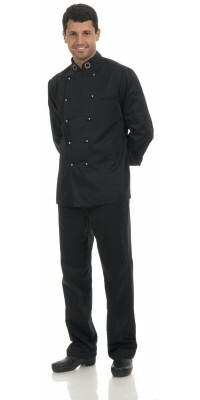 - Best Chef Jacket, available both for men and for women. It’s designed on the basis of Gran Maestro Jacket, but is delivered complete with several embroideries: tricolour on the collar, a fine “Best Chef” embroidery on the right, the “Italy” embroidery in the heart zone and embroidery of your name above the pocket. - Slim fit Jacket Rodrigo (for man) and Isabel (for woman), available in white only, dedicated to those who prefer a more contemporary and tight fit jacket. The Gran Maestro, Dama and Best Chef Jackets, are made with Comfort Satin “Cotton on the Skin”, a premium Gabardine that ensures the best comfort and looks like “new” after many washes too; the fabric is not the only added value of these garments: in fact, the jackets have an underarm micro-mesh airing insert and another micro-mesh insert with comfort pleat on the back to ease the user's movements during his/her work. The Rodrigo and Isabel jackets instead, are made with Flamingo Stretch Gabardine, a stretch cotton gabardine with a little percentage of elastic fibre (96% Cotton, 4% Elastane). If compared with the classic pure cotton, this fabric allows to make more comfortable garments: the stretch fibre, in fact, makes the operator’s movements easier, while the natural fibre ensures a perfect transpirability even in the hottest environments. To complete this line of chef uniforms we suggest Executive Chef Apron, Gran Maestro Apron and Italia Apron, all long models with cuff. 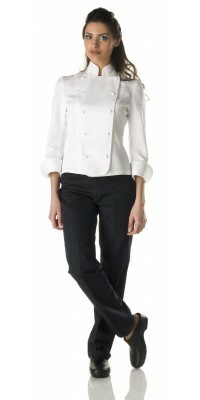 Female chefs' White jacket, model DamaWhite pull-out buttons micro-mesh band and pleat on the back Immediately available for delivery: sizes from S to XL Made of Comfort Satin, 50% Cot., 50% Pol. "cotton on the skin"
Women's White jacket with gold buttons, model Best Chef Italia Embroidery with your name, "Best Chef" and "Italia" included micro-mesh band and pleat on the back Immediately available for delivery: sizes from S to XL Made of Comfort Satin, 50% Cot., 50% Pol. "cotton on the skin"
Men's White jacket with gold buttons, model Best Chef Italia Embroidery with your name, "Best Chef" and "Italia" included micro-mesh band and pleat on the back Immediately available for delivery: sizes from S to XL Made of Comfort Satin, 50% Cot., 50% Pol. "cotton on the skin"
White jacket, model Gran Maestro Black pull-out buttons micro-mesh band and pleat on the back Immediately available for delivery: sizes from S to XL Made of Comfort Satin, 50% Cot., 50% Pol. "cotton on the skin"
Black jacket, model Gran Maestro Silver pull-out buttons micro-mesh band and pleat on the back Immediately available for delivery: sizes from S to XL Made of Comfort Satin, 50% Cot., 50% Pol. "cotton on the skin"